Your day-by-day itinerary now includes Milocher Park, Citadel and Mogren Beach. Kick off your visit on the 20th (Sat): don't miss a visit to Crkva Svetog Tome, kick back and relax at Milocher Park, and then enjoy the sand and surf at Becici Beach. Here are some ideas for day two: enjoy the sand and surf at Mogren Beach, then contemplate the long history of Citadel, and then contemplate the long history of Altstadt (Old Town) Budva. To find where to stay, ratings, photos, and tourist information, refer to the Budva trip itinerary builder. Paris, France to Budva is an approximately 7.5-hour combination of flight and bus. You can also drive; or take a bus. Expect somewhat warmer weather when traveling from Paris in May: highs in Budva hover around 27°C, while lows dip to 13°C. Finish your sightseeing early on the 22nd (Mon) so you can drive to Podgorica. Podgorica is the capital and largest city of Montenegro. Start off your visit on the 22nd (Mon): explore the activities along Skadar Lake National Park, pause for some serene contemplation at Dajbabe Monastery, then trot along with a tour on horseback, and finally take in the architecture and atmosphere at St. George's Church. On your second day here, learn about winemaking at 13 Jul-Plantaze Vineyard, then contemplate the waterfront views at Bukumirsko Lake, and then explore the activities along River Tsrnoyevicha. For maps, other places to visit, and more tourist information, refer to the Podgorica sightseeing planner. Drive from Budva to Podgorica in 1.5 hours. Alternatively, you can take a bus. In May in Podgorica, expect temperatures between 28°C during the day and 16°C at night. Wrap up your sightseeing on the 24th (Wed) early enough to drive to Ulcinj. Ulcinj is a town on the southern coast of Montenegro and the capital of Ulcinj Municipality. You've now added Bar Stari Grad to your itinerary. On the 24th (Wed), see the interesting displays at Ulcinj Museum of Archaeology, Ethnology and Local History, then explore the activities along Bojana River, and then kick back and relax at Beach Velika Plaza. Keep things going the next day: admire the striking features of Bar Stari Grad, then make a trip to Old Olive Tree, and then take a stroll through The Old Town. To find ratings, other places to visit, where to stay, and tourist information, refer to the Ulcinj custom trip planner. Traveling by car from Podgorica to Ulcinj takes 1.5 hours. Alternatively, you can do a combination of train and bus; or take a bus. In May, daily temperatures in Ulcinj can reach 29°C, while at night they dip to 17°C. Finish your sightseeing early on the 25th (Thu) to allow enough time to drive to Kotor. Explore hidden gems such as Plavi Horizonti Beach and zvonik. Your cultural itinerary includes sights like R.K.C. Gospa od Škrpjela and Grubonja Palace. Explore the numerous day-trip ideas around Kotor: Lovcen National Park (in Cetinje) and Perast (St. Mark’s Church & Palace Zmajevic). The adventure continues: explore the activities along Bay of Kotor, pause for some serene contemplation at Church of Blazena Ozana, make a trip to City Walls, and tour the pleasant surroundings at Kalardovo Beach. To find traveler tips, where to stay, ratings, and more tourist information, refer to the Kotor travel itinerary planner. You can drive from Ulcinj to Kotor in 1.5 hours. Alternatively, you can take a bus. 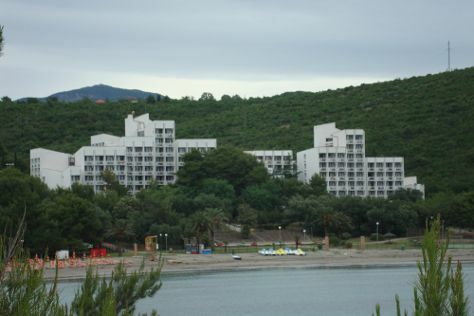 Traveling from Ulcinj in May, you can expect nighttime temperatures to be slightly colder in Kotor, with lows of 13°C. Cap off your sightseeing on the 31st (Wed) early enough to travel back home.